Easy to operate, very well constructed, and the orange colour scheme certainly stands out! The rounded back panel design may not appeal to all users, and may look slightly out of place if the microwave isn't placed into a corner. 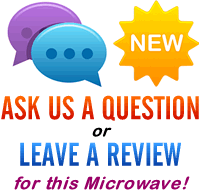 Looking to purchase an orange microwave? Your options are pretty limited, as the majority of manufacturers don't cater for this colour scheme; however the Max 35 Orange from Whirlpool not only fits the bill, but also offers pretty good value. Overall build quality is very good - the unit feels solid, and the controls are simple to use. These controls are located underneath the door, thus saving space over traditional microwaves with right hand control systems. The back panel is rounded, which enables this microwave to fit neatly into a corner. This does affect the overall capacity in theory, but as corner space is essentially wasted in a microwave, usable space is not reduced. A 28cm turntable is featured, which should be fine for the majority of users. Performance is great - we've reviewed this model several times, albeit in different colour schemes, and we've yet to fault this model. In order to view the various colour options the Max 35 is available in, scroll down to the Specification section below. Power output is 750w, which is divided into 7 different power settings, including the remarkable Jet defrost system. Our testers are very fond of this model, and whilst the orange colour scheme may not suit all kitchens, in terms of performance it can't be faulted. A very well built solo microwave, which is easy to use and features a handy space saving design. 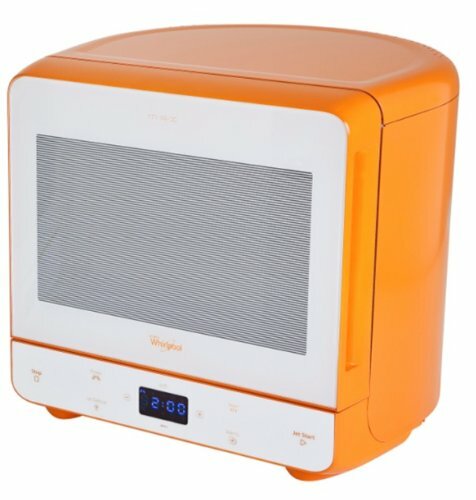 If you're looking for an orange microwave, then the Max 35 from Whirlpool is well worth bearing in mind.